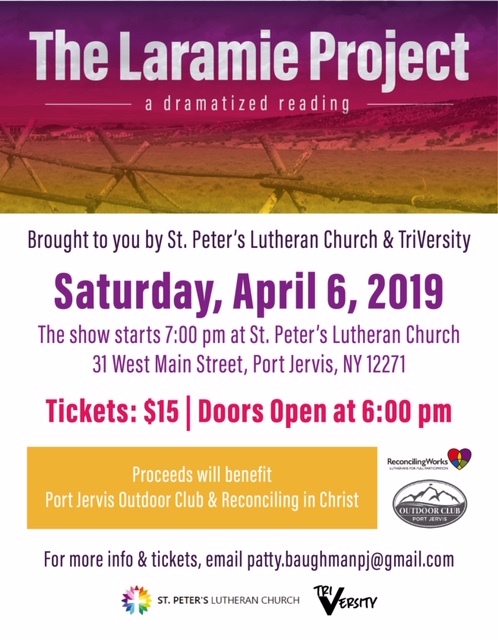 The Laramie Project is a breathtaking theatrical collage that explores the depths to which humanity can sink and the heights of compassion of which we are capable. It is the story of Matthew Shepard of Laramie, Wyoming. Screenwriter Moishe Kaufman and Tectonic Theater members have constructed a deeply moving theatrical experience from interviews and their own experiences. Patty Baughman brings these experiences to Port Jervis, NY.